Andrea Nahles was elected on Sunday as the first president of the Social Democratic Party of Germany (SPD) in 155 years of political education history. 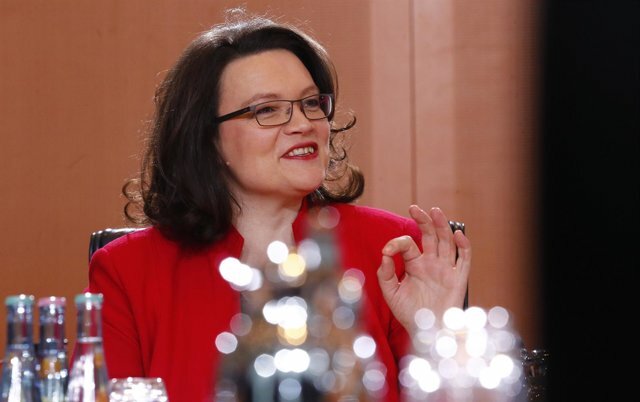 Nahles, leader of the parliamentary bloc of the formation, has been elected with 66.35 percent of the votes, according to the result of the extraordinary congress of the SPD held today in Berlin. The elected, who was also the head of the Social Democratic Youth and secretary general of the SPD, started as a favorite with the support of the party's executive. Some 600 delegates and the 45 members of the Executive have departed in a vote with very high expectations due to the imperative need of the SPD to recover the popularity and tranquility lost since the general elections, in which it obtained 20.5 percent, the worst result since the founding of the Federal Republic of Germany in 1949. The comings and goings of the party that then announced that it was going to the opposition after four years of alliance with Merkel and that finally agreed to ally again with the conservative leader also passed bill and saw him fall into the intention to vote even below the far right Alternative for Germany (AfD). The lack of confidence towards the Social Democrats persists in the German electorate. A poll by Deutschlandtrend places the SPD at 17 percent, well behind Merkel's Christian Democratic Union, at 32 percent. In addition, 47 percent of those questioned doubt that Nahles can unify the party and get it out of the quagmire.